007802515X -This best-selling text gives music majors and minors a solid foundation in the theory of music. It strengthens their musical intuition, builds technical skills, and helps them gain interpretive insights. The goal of the text is to instruct readers on the practical application of knowledge. The analytical techniques presented are carefully designed to be clear, uncomplicated, and readily applicable to any repertoire. The two-volume format ensures exhaustive coverage and maximum support for students and faculty alike. Volume I serves as a general introduction to music theory while Volume II offers a survey of the theoretical underpinnings of musical styles and forms from Gregorian Chant through the present day. The supplemental instructor’s materials provide clear-cut solutions to assignment materials. 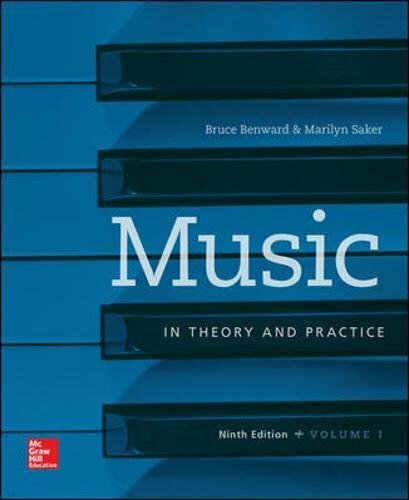 Music in Theory and Practice is a well-rounded textbook that integrates the various components of musical structure and makes them accessible to students at the undergraduate level.